Dancing in the Rain: I don't wanna! You can't make me! I don't wanna! You can't make me! This week's Listicle topic was chosen by Wendy at Twisted Domestic Goddess and is 10 things I would rather do than clean the house! Since I'd rather do almost anything than housework, this should be easy-peasy. That was said way back in 1966. Huh. So true, yet there's still so much guilt if our homes are messy. We moms (or just women in general) really need to cut ourselves some slack. Cleaning is not the most important thing in the world! Yes, it's gotta be done, but I don't believe we need to break our backs. Staying up til midnight should be spent watching TV, reading or hanging with the hubby, not folding that last load of laundry. You can do it tomorrow. Balance, people! 5. Have "family movie night"
*My house is not a disaster. I do clean it. **By the way (Jim), I'm working on knitting my second legwarmer. I'm with you on all counts. Family Guy reruns are on at 11:00 PM here, so it works out. Oh, but I love getting in a made bed. So glad you found me! worst update ever. You're "working on" it? You've been working on it for months!! Pics!!! I said a similar quote on my blog too. cleaning really is futile when you have young kids. The irony of my post today is that I had to clean my house because company was coming. Within 15 minutes of them arriving with their kids: I had the train track and trains laid out all over my rec room, the Twister game, various Barbie dolls and their gear, Transformers, and Lego. After they left, I had to clean it all up again, and the lunch dishes. When I'm having people over with kids, I only clean up the downstairs where the grown-ups will be hanging out and make sure toilets are clean. I so agree with you, the cleaning is never ending and there is always tomorrow. We do need to let ourselves off the hook more. 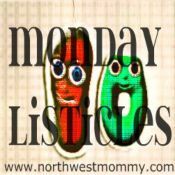 Loved your list - family movie night is a favorite of mine too! Keeping your house clean enough to be healthy and presentable is enough. Do a yearly "spring cleaning", and you're golden. That show is so damn funny! Ugh, anything is better than cleaning house. I think I'd rather clean house than have dental work. OK, I'll try to watch more Family Guy! You're (maybe) from there?? How cool are you? Yes, my mother was always cleaning -- but back then she could afford to have someone help twice a week. And mom also took a nap every afternoon. I used to look at her and think what a waste of time. ha. My mom takes naps now, but she used to make me feel like it was a waste of time, so now I have a hard time doing it. You are so right about balance. I used to beat myself up for our messy house, but I figured out that this is life with kids and life is much better when we cut ourselves that much needed slack! There will ALWAYS be housework to do. Our kids won't always be kids! It's about damn time with the legwarmers! You forgot to add talking to me to the list. Don't worry, I forgive you. Yeah well, where's your list, missy?? Maybe you could crochet yourself a robot that would do the cleaning? Or some fuzzy slippers/mittens that you could use to dust? Hey yeah, maybe I could! Ha ha ha your 2nd leg warmer! Thanks for the laugh :) I agree with cleaning and kids, or husbands really!